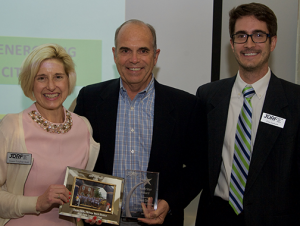 Dean Sink accepts SuperStar Award from JDRF’s Eleanor Schaffner-Mosh and Eric Durham. The Piedmont Triad (NC) Chapter of the Junior Diabetes Research Foundation (JDRF) presented its first-ever “SuperStar Award” to Dean Sink, President/CEO of Mickey Truck Bodies, who served as Corporate Chair for the High Point One Walk on April 29, 2017. Under Dean’s leadership the Walk broke records for dollars raised and number of participants – including individual walkers and corporate sponsors. Dean was also elected as a Chapter Board member to serve a 2-year term. JDRF is the leading global organization focused on type 1 diabetes (T1D) research, and has committed over $2 billion to research since its founding in 1970. The organization is currently sponsoring $568 million in charitable research, including 50 active clinical trial, in 18 countries. The Piedmont Triad Chapter covers 14 North Carolina counties.